A Gemba Walk is the practice of managers, supervisors, and executive leaders personally observing the place where work is being done. It is used by people who practice the Lean and Six Sigma business methodology, and by others who are devoted to continuous improvement. 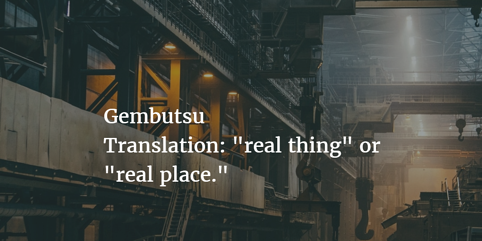 The original Japanese term comes from gembutsu, which means “real thing” or “real place.” Thus, the Gemba is wherever work happens and value is added to products or services. The Gemba may be a production floor, an emergency room, a construction site, or a classroom. During a Gemba Walk, managers physically go to the places where people are putting together products, helping customers, analyzing data, maintaining machinery, or any other process. The philosophy behind Gemba Walks rests on the idea that it is easier to gather feedback, spot process or workspace issues, and build trust with the team by observing work first hand. Employees tend to be more open to pointing out opportunities for improvement, or sharing concerns when they are in their own workplace. Leaders who have committed to Gemba Walks typically spend about 45-60 minutes a week at the Gemba. They pay careful attention, ask questions, and observe processes, but do not implement on-the-spot improvements. Improvements are made only after careful reflection and often the introduction of a structured improvement cycle such as PSDA or DMAIC. There are a number of reasons that Gemba Walks are an effective improvement technique. Opportunities for improvement are easier to spot from the work place than the board room. Gemba Walks reinforce executive commitment to improvement. They create a greater and more empathetic connection between workers and management. They give frontline workers an opportunity to participate in improvement and a way to raise concerns or questions. Gemba Walks give leaders the opportunity to recognize employee achievement and engagement. Leaders get the chance to see the results of past improvement efforts. They provide an opportunity for a new perspective. How Do I Do a Gemba Walk? You don’t want your team to feel blindsided by a Gemba Walk - it isn’t a surprise inspection, rather it is a technique for working together for positive change. Therefore, it is essential to describe the purpose of Gemba Walks and let the team know what to expect. The emphasis should always be on taking away obstacles and helping the team do their best work. Open communication in advance will help people feel more comfortable and foster engagement. Gemba Walks are not the same thing as Management by Walking Around. During a Gemba Walk, leaders usually have a specific process or task in mind that may present an opportunity for improvement. It is often associated with a specific Key Performance Indicator that merits attention. If you follow the value stream for your organization, you will likely find that the biggest opportunities for improvement rest at the handoffs between processes, peoples, or departments. Those areas may yield the most potential for eliminating waste. Gemba Walks are not designed for employee performance evaluation. They are collaborative efforts to understand and improve processes and works spaces. You never want your Gemba Walks to become adversarial, so provide correction and coaching another time. Because you will spend some time thinking about what you have observed before acting, it is smart to take copious notes and even augment your memory with photos if that would help. A good mantra for your Gemba Walk is, “Assume nothing.” Don’t guess at why people are doing things in a certain way or in a particular sequence, ask them. Don’t assume that Standard Work documentation accurately reflects what is happening in real life. Ask questions about exception handling, work space arrangement, supplies, and other realities of getting the job done. We mentioned this before, but it is worth repeating and somewhat counter-intuitive. The Walk is a time for observation and information gathering, but not action. Once you have completed your observations, you can identify opportunities for improvement or ask employees to do so. Then you can decide as a team what actions to take. After your walk is over, be sure to follow-up with the teams, let them know what you learned and ask for additional input. Even if you aren’t going to take any action as a result of the Walk, it’s a good idea to close the loop so people aren’t left wondering about your impressions. Hopefully, this post has been a good introduction to this very useful improvement technique. Our clients in industries as varied as construction and healthcare find Gemba Walks to be a valuable tool in the improvement toolbox. We hope you will too!